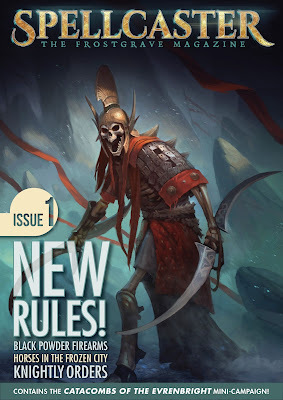 In case you missed the news last week, today I am releasing Spellcaster: The Frostgrave Magazine. This first issue contains all kinds of goodies for lovers of the Frozen City, including rules for black powder firearms, horses, knightly orders, and a bunch of new scenarios. The magazine is only available digitally. You can buy it now from RPG Now. Or, it can now be pre-ordered on Amazon and should be released on July 2 (Although it is saying July 7 at the moment). If neither of these work for you, drop me a line and you can buy it directly from me. Once you've had a chance to look it over, come on back here and let me know what you think. This is the first issue, and I'm sure there is plenty I can do to improve upon it. For anyone who can’t get enough Frostgrave, I’ve got an exciting announcement. Next Friday, June 30, I will be releasing the first issue of Spellcaster: The Frostgrave Magazine. This is a PDF-only magazine, mostly written and assembled by myself. While I have the blessing of Osprey Games, this is a purely independent project. It’s a chance for me to write rules and other game material that either don’t really fit the game world or just don’t mesh well with any of the major releases. It does also mean the internal layout is done by myself, so don't expect anything amazing there! So what is in this inaugural issue? Also, as you can see, I’ve managed to convince Frostgrave veteran, Dmitry Burmak to help out with cover art! This issue of Spellcaster will consist of 18 pages, have a cover price of $5, and will initially be available through RPG Now and Wargames Vault, with Amazon hopefully following soon as well. If none of these work for you, feel free to contact me, and I’m sure we can work something out. HT Publishers will also be producing a Spanish edition of the magazine which will be available on the same day. Way back in April (seriously, it seems a long time ago), I took a trip to the USA for Adepticon. Among the many little treasure I came back with was this guy. This figure was given to me by one of the organizers of the show - apparently he commissions a figure every year as a personal give-away. 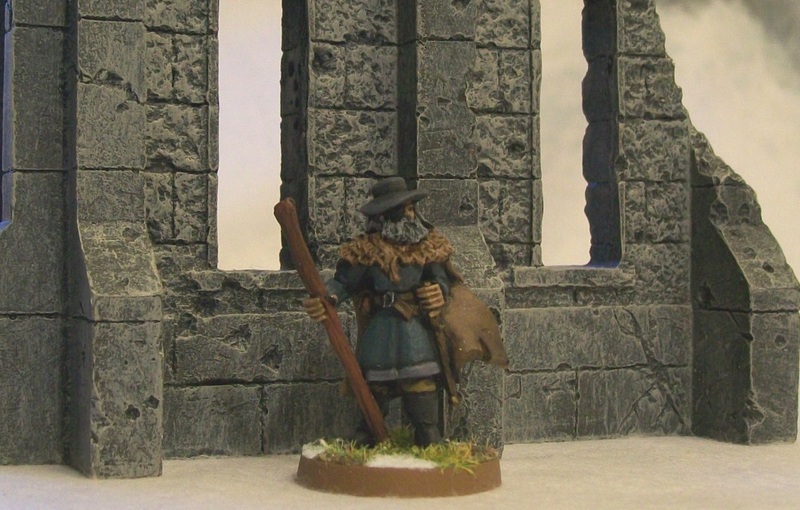 I think I have found my next wizard for Frostgrave! (Now I just need to find a game! ).